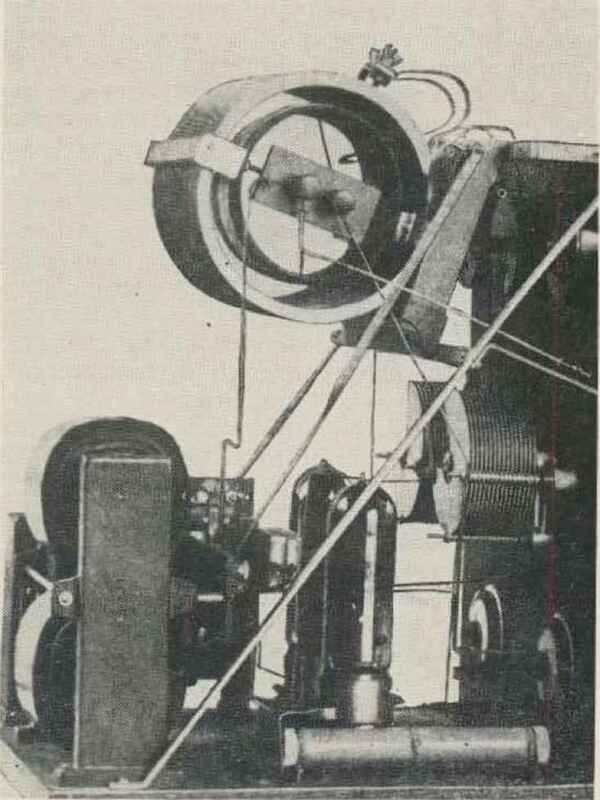 Tuned-plate, tuned-grid transmitter of the 30s+ Grid coil on left, plate coil on right. 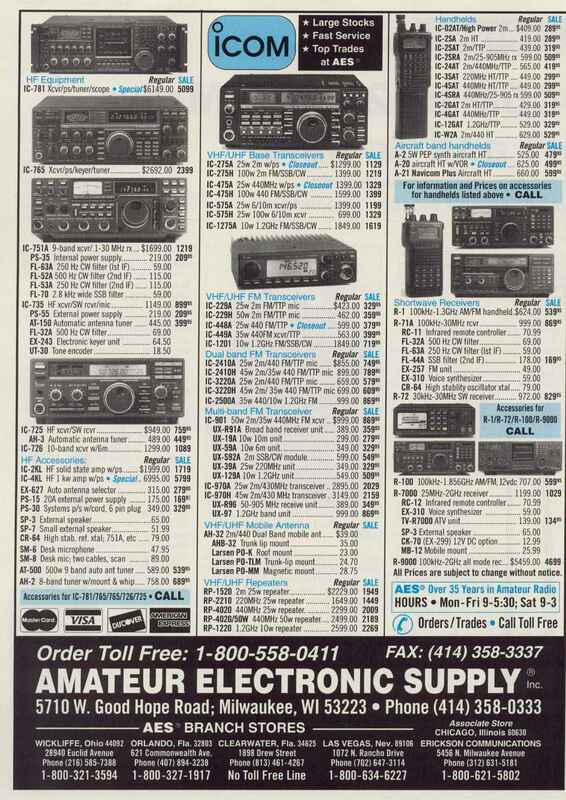 Nkwcomeirs to the ham ranks take the "variable frequency oscillator" or "VFO" as it is popularly termed, for granted. If they have entered the field via the Novice route, a VFO is of course, 'forbidden fruit' until such time as they qualify for a higher class of license. Surprisingly enough, a large number of relatively uo\d timers" among the General class licensees accept the VFO as a development of fairly recent years, Let's see how recent! 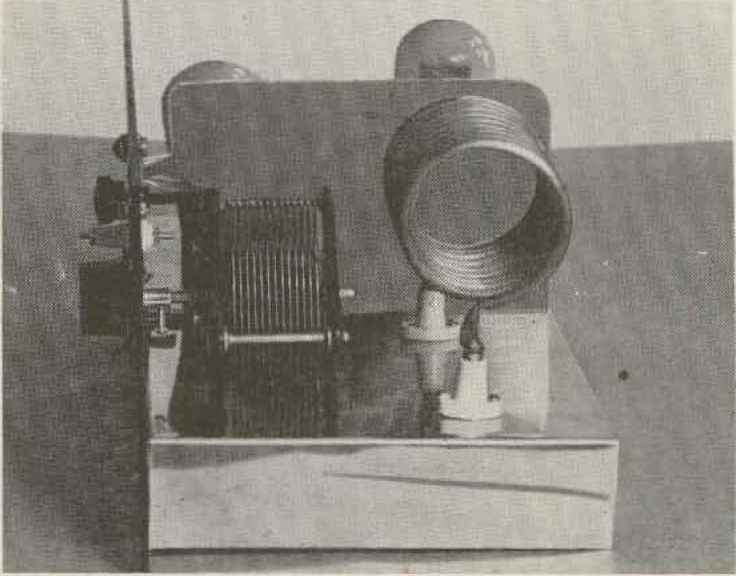 Right after World War I, when the ban was lifted from amateur operation (October 1919), great interest was exhibited in the vacuum tube as a generator of radio frequency oscillations not only by hams but by commercial companies and the military services as well. 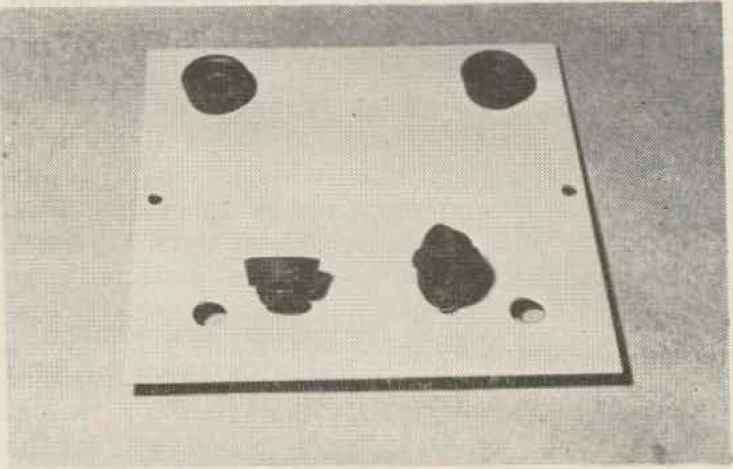 Experimental work in various laboratories during the period of hostilities had rather conclusively demonstrated that great possibilities were evident here. 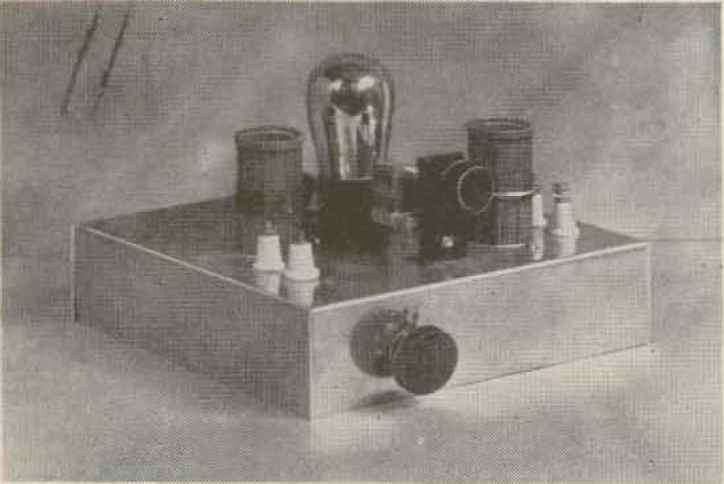 While vacuum tubes had previously been used to a limited extent, chiefly by Dr. Lee deForest, their inventor, as radio frequency generators, they were not popularly accepted either in amateur circles or by commercial operating interests; "spark transmitters predominated in the wireless/radio communication field, How could you possibly work any DX with 5 or 10 watts of power from a little lamp when you had trouble covering three to five hundred miles with a quarter or half kilowatt "rock-crusher"? Side view of the 200 meter transmitter. The grid coil is mounted Inside the edge-wound plate inductance. of salt water but too, maybe they've got something there! If we ever get out of this navy and back on the air, Jet's try it!" And they did! The transition period was relatively slow; many "die-hards" who had only heard of the marvelous performance of the tiny vacuum tube , . . they had not been assigned where they could actually observe this - . * still swore by 'spark7 and stuck to their guns, Just the same, more and more of the peculiar, high-pitched whistles began to appear in the regenerative receivers of that day. The remarkable thing was that such stations, many a thousand or more miles distant, were consistently heard stating that they were using only 5, 73/£, 10 . . . only a very fewT were reporting as much as fifty watts of power! Remember too, that, the frequency or 1 wavelengths' as it was then referred lof was in the neighborhood of 200 meters or 1500 kilocycles, admittedly far less effective than the much higher frequencies which we use toil ay. And, the use of vacuum tubes seemed to offer a solu tion to a whale of a lot of problems which had been plaguing the development of the radio telephone 1 It began to look like it wouldn't be too long before the hams could converse by means of the human voice, as well as the more conventional keyed characters of the radio telegraph code! That did it! Somewhat of a landslide started, Hams by the score were investing in transmitting vacuum tubes and appropriate power supply components, both of which were beginning to appear on the open market. Tubes were available in several wattage ratings; most popular at the outset was the UV-202 which was, if my memory isn't faulty, rated at 1% watts. In most cases, the ham woefully overloaded them and they ran closer to 15 or 20 watts in many rigs even if their metal plates did turn a cherry red or better! But they worked! 't was not long before the UV-203 tube, with a rating of fifty watts appeared. 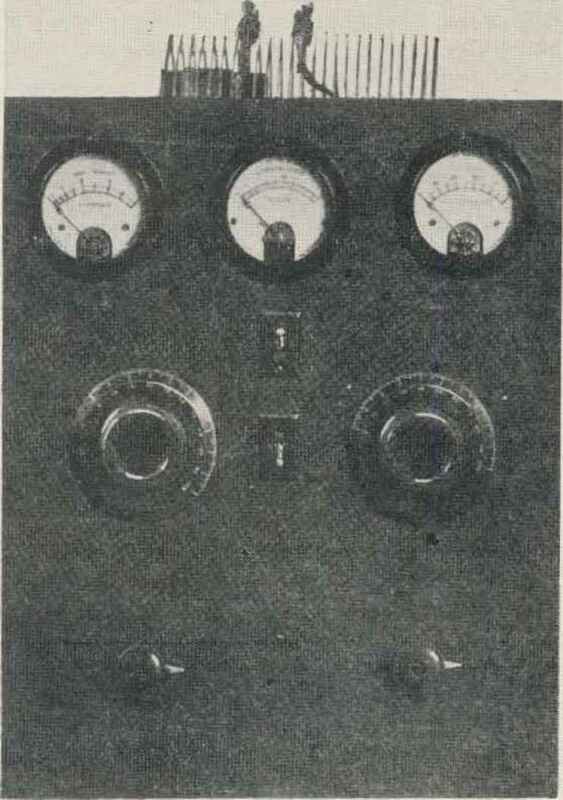 100 watt 200 meter transmitter circa 1924, The wavelength was adjusted by the two variable condensers. And what did the ham use for an oscillator circuit? Current magazines were literally saturated with construction articles and schematics covering vacuum tube transmitters* Circuits were devised, altered and 'improved' practically overnight. It made your head swim; what to use? Invariably an 'oscillator' tube was employed; it was the actual radio frequency generator and the real heart of the rig. Hartley and Colpitis oscillator circuits were the most popular among the early experimenters. Basic equipment was the tube, an inductance coil, variable condenser and a small handful of fixed condensers and resistors; maybe an rf choke or two. Often the inductance for even a five watt rig was wound of Vi" copper tubing or even larger I It just didn't seem reasonable that a transmitter would work with smaller diameter conducting material when we remembered that our spark rigs invariably called for such copper "pipe" or heavy copper ribbon for the "oscillation transformer"! Nook at the oscillator coil in your rig today; probably wound with #20 or #22 wire; the final amplifier coil in even a half kilowatt modern rig, seldom uses anything larger than #10 copper wire! Many of these initial tube transmitters consisted merely of an oscillator feeding directly into an antenna; no buffer, no intermediate or final amplifiers; strictly a one tube job (ignoring the rectifier lube or the 'slop-jar' rectifier, of course!). And, by simply moving clips on the oscillator coil and adjusting the variable condenser, any frequency within the L/C limits of the circuit components, could be rapidly tuned! What was that other than a 'variable frequency oscillator1 . . . a VFO? Although commercial rubber "bumpers'* or protective mounting feet are manufactured for installation on electronic equipment, they are often difficult to locate and the proper size may not be immediately available. Automotive supply stores stock replacement rubber hydraulic brake cups in a variety of sizes and prices on these items are reasonable, ('he photograph shows the original unit and its installation in a metal plate. The groove at the top securely holds the foot in the mounting hole. The rubber tip which projects into the cup is cut off with a pair of diagonal pliers. These mounting feet are a distinct improvement over those commercially available. The suction cup action will hold the equipment had been added additional L/C components in the grid circuit, making that also tuneable. Whether this was any gain over the simpler oscillator circuit alone or not, is somewhat of a moot question today; at any rate they worked good ... I used one for a couple of years. The commercial companies as well as the military communication branches were not asleep either. The amateur was pointing the way with his impressive increase in signal exchange distance and the exceptional sharpness of the emission permitting dozens more stations to operate within the frequency sector formerly dominated by one spark signal! 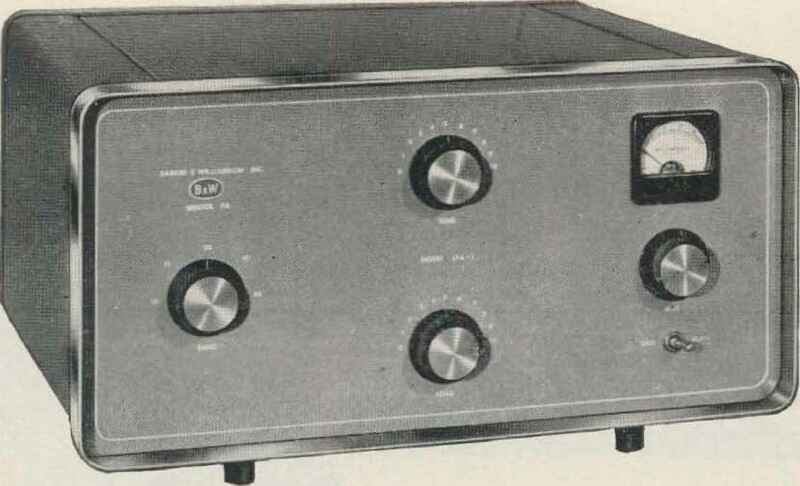 As with the amateur, newly designed commercial equipment incorporated a "tuneable oscillator" to which the power amplifier and the antenna could be resonated throughout the frequency range of the equipment. What were these other than 'VFOV basically?